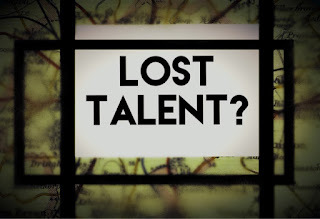 Art With Mr. E: Sunday Devotional With Mr.E: Talent Lost? BUT THIS IS WHAT WAS ON MY HEART TO SHARE TODAY. I stood there in my college sculpture class looking at my hand caught in a machine. I said nothing. The pain was unbelievable, but the fear of what could be was even greater. I kept repeating in my head..."I just ruined my art career." Time truly seemed to stand still in that moment. I got my self together enough to release the lever on the side of the machine, and attempt to lift the top roller that was crushing my fingers. I managed to raise it up enough to pull my trapped hand out. My glove that had been hiding the damage was still caught in the rollers. Now revealed was mangled skin, visible bone, and more blood than I had seen before. My art career was over. I snapped out of it, and ran to my professor...leaving what looked like a murder seen in my wake. He grabbed my arm and dragged me to his office where he picked up a dirty rag from the floor and wrapped my hand. In my head I was thinking..."Oh great, now I'll have gangrene on top of it all?!?!" I said nothing because I was too nauseous to speak. One of the guys in the class volunteered to take me to the emergency room..noting that he had plastic seats and didn't care if blood got everywhere. He dropped me off at the hospital and wished me well. I was left at the door holding a dirty rag on my bloody hand, and all I could thing was..."I ruined my art career." After waiting an incredibly long time for someone in my condition...an ER doctor looking at my injury and informed me that I'd have to have my thumb, index, and middle finger removed. However, the only doctor who could perform the procedure was in a hip replacement. I laid on the bed in the ER alone...asking God to meet me in that moment & help me come to terms with what was about to happen. He did!. In that moment, I knew that no matter what happened...my life had a purpose & a plan. It might not look like what I had expected or planned, but it was going to be full & meaningful. My purpose was not found in just one talent/skill, but in who I am at the core. This verse was spoken to the people of Israel about their 70 year exile in Babylon. It was a verse to reassure them that he never left them. It was a verse to remind them that all things can work together for good for those who love the Lord. It was a verse to give them hope for the future he had for them. I came to a place where I knew there was more for me no matter the outcome of my injuries. I didn't know what it would look like, but I had hope for the future...and that was enough. It was amazing the conversations I had that day with the nurses, doctors, and hospital staff. They were not use to an injured patient asking how they were doing or inquiring if they had any prayer requests. As it turned out...I was able to keep my thumb & fingers (though damaged). The doctor who came down to remove them picked through the mess that was my hand....stopped...looked at me...and asked "Do you have people praying for you? Because that is my only explanation for why I'm not removing your fingers right now!" He told me that with the amount of skin damage I had...that it was unheard of for there to be no bone or tendon damage. So...he sewed me back up, and sent me on my way. Recovery took months. I had to paint, draw, and write with my non-dominant hand for a majority of that time. One of the fingers might be a little disfigured & there may be some nerve damage, but they are all present & accounted!! I'm still able to draw, paint, and create. I also was able to talk to many students after my accident that told me they did know if they could go on with their life if they lost their ability to create. I was able to share with them that they were so much more than just their ability/talent/skill. I am so thankful to have had the opportunity to have so many good...deep...meaningful conversations out of this terrible accident. We can find power in the midst of the pain. We can find purpose outside of our plans. We can be the light in dark times....even when they are our own. Wow! So glad you got to keep you digits! It’s amazing how God uses our brokenness to open doors to ministering to our kiddos! I can relate. I struggled with Lyme disease for over a decade. My body was racked with pain and exhaustion, and at my lowest moments, I dispaired of life itself. My students know this. It’s made me a safe person for my students to share their struggles with. What a beautiful story. Thank you for sharing it and for continuing the share the true source of identity with the people you meet. What a beautiful story. Thank you for sharing and for continuing to share with people all over the true source of identity.